Check out Tobi's The Chills Off Shoulder Sweater Show some shoulder. The Chills Rose Off Shoulder Sweater features an off the shoulder foldover neckline, extra long sleeves, and an oversized fit on a chunky acrylic knit. Go for an edgy vibe and wear this oversized pullover with distressed overalls and boots! Show some shoulder. The Chills Rose Off Shoulder Sweater features an off the shoulder foldover neckline, extra long sleeves, and an oversized fit on a chunky acrylic knit. Go for an edgy vibe and wear this oversized pullover with distressed overalls and boots! Show some shoulder. 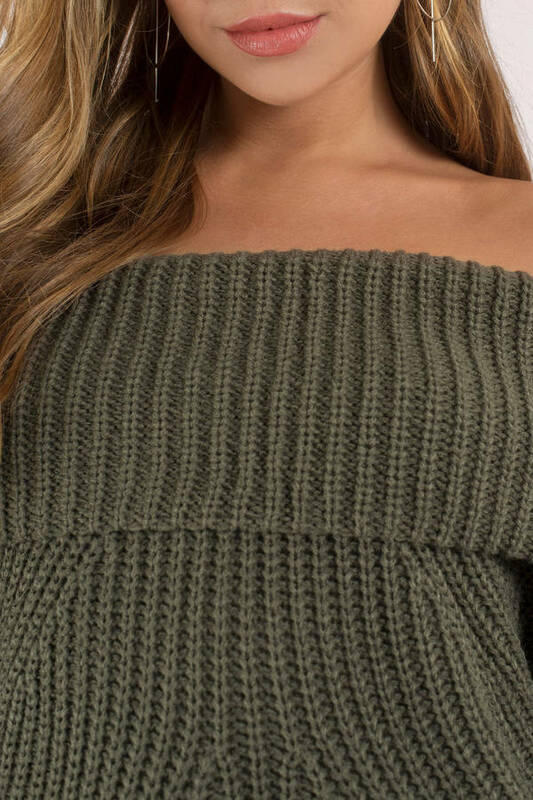 The Chills Olive Off Shoulder Sweater features an off the shoulder foldover neckline, extra long sleeves, and an oversized fit on a chunky acrylic knit. Go for an edgy vibe and wear this oversized pullover with distressed overalls and boots! Show some shoulder. The Chills Wine Off Shoulder Sweater features an off the shoulder foldover neckline, extra long sleeves, and an oversized fit on a chunky acrylic knit. Go for an edgy vibe and wear this oversized pullover with distressed overalls and boots! Show some shoulder. The Chills Black Off Shoulder Sweater features an off the shoulder foldover neckline, extra long sleeves, and an oversized fit on a chunky acrylic knit. Go for an edgy vibe and wear this oversized pullover with distressed overalls and boots!